Last week’s S&P 500 (NYSEARCA: SPY) move exceeded 4 standard deviations from the October 3 close. This week, the S&P 500 followed up with a flat close despite the intraweek volatility. 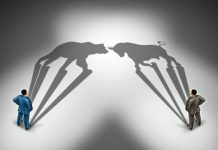 The indexes short-term sentiment moves followed an expected pattern – similar to what the S&P 500 showed in early April. The Russell 2000 (NYSEARCA: IWM) held its break below the 200-day Moving Average (MA) but showed a long lower shadow (inverted hammer) this week. Next week’s close is key for small caps. Watch the 1650 level. Other major indexes are showing bearish but not oversold short-term sentiment on their weekly Market Forecast charts. They’re also still holding their respective 200-day MAs with smaller ranges this week compared to the past two weeks. Heikin Ashi candles do not show a new lower low this week. Volatility (INDEXCBOE: VIX) jumped as expected but usually doesn’t follow through after one surge with another volatility surge. Look for gradual volatility moderation. Big week next week with corporate earnings in tech names and Q3 GDP. Enjoy this weekend’s video. For those with limited time – see bullet points below from the video. Seasonality for the time of year makes a difference when comparing to April. Another comparison of short, extreme moves to 200-day MA in a mid-term election year is October 2014. Inside day again today suggests near-term low may be forming. Volume and trading range were near their higher averages. Also, the next stage of market bullishness may be led by foreign market outperformance and commodity prices with sector rotation into late cycle areas after initial high-beta surge off lows.